Does anybody remember that ulta-realistic third installment of the Fast and Furious series where high school kids (poor Texans and Yakuza members alike) drive 500 horsepower drift machines with easily $100k in aftermarket parts? Between the RX-7s, Evos, Zs, and Tourans you might have missed the star of the movie, an RB26DETT swapped 1967 Ford Mustang fastback, except that isn't this car. The Japanese inline-6 powered fastback was used for some static shots, but the real star of the climatic drift scene was a 403 cubic inch V8 powered beast that was bashed up on screen -- that's what we've got here today. Anyone with an internet connection should know that the 7th installment of the Fast and Furious franchise comes out in the theaters this weekend -- Furious 7. I haven't seen it, so I can't give it a two bloody knuckles up at this time, but if you are looking for an actual Fast 'n' Furious movie car, you've come to the right place. Find this 1967 Ford Mustang from The Fast and the Furious, Tokyo Drift offered for $45,000 in Sun Valley, CA via craigslist. 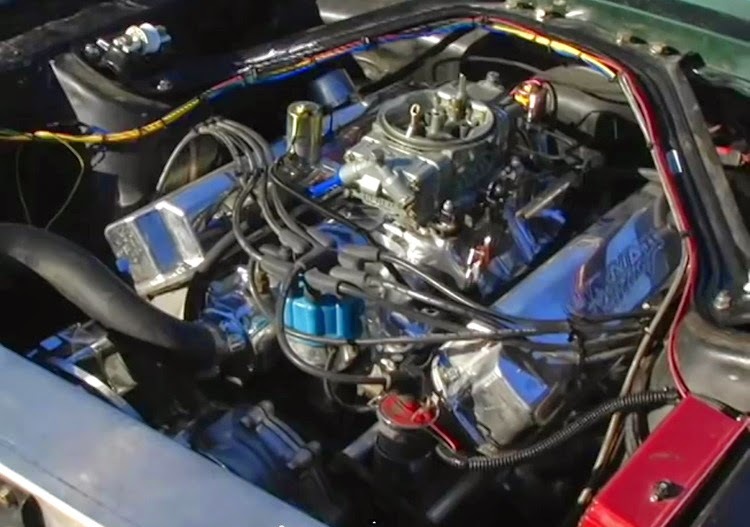 The on screen car was supposed to be Skyline RB26DET powered, but according to this 2006 Edmunds story, the director used a 403 V8 powered example for much of the filming. Apparently the big cubes were preferred to make the drifting scenes easier over the turbo inline-6. I was first suspicious that this might be a recreation or a fake, but the pictures don't seem to be harvested from some other place and they show the tell tale signs of being located at a body shop (more about that later). According to the Edmunds article (and inside line video) the V8 pushes out something in the realm of 500 horsepower and the car is equipped with rack-and-pinion steering and setup for drifting. 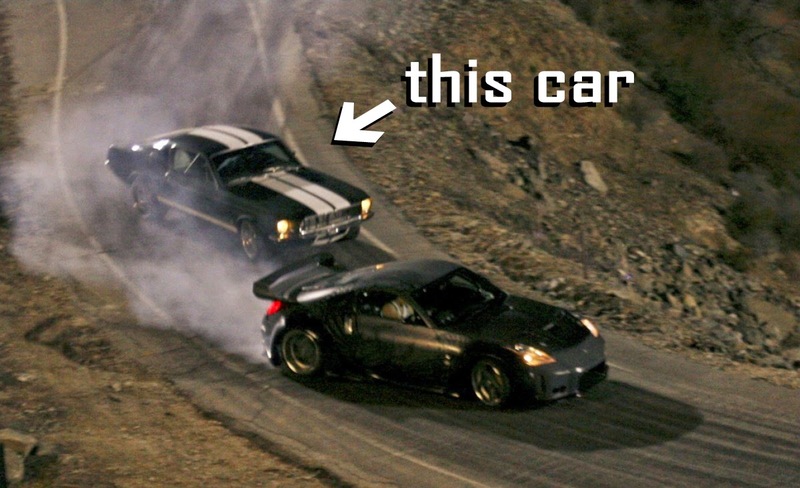 The above photo is a screen capture from the Edmunds video, which pretty much confirms that this is the same car. The wire colors, valve covers, MSD box, zip ties and everything are spot on identical, except the seller's photo is covered in sanding dust from a paint shop. If you watch the video (or the movie) you will notice that this fastback was seriously banged up in the course of filming, but looks to have been thoroughly reconditioned in its current state. 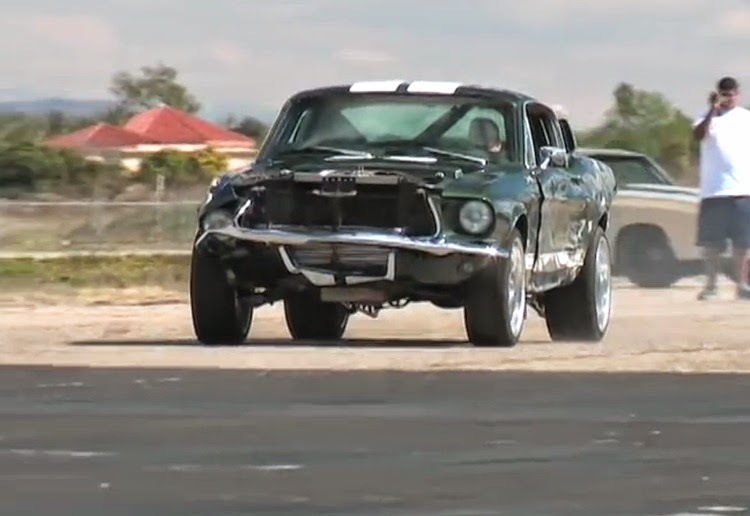 Another screen capture from the inside line video shows just how much abuse the Mustang received in the course of filming. If my memory serves me, the car in the movie ended up flipped and generally wrecked in the final scene, so it would need complete reconditioning. Ha! The fry line really is paying well these days at McD's, I guess. Can we add a discussion of car movies to this post? Here's one I just saw again - it's been at least 25 years - that I thought was a whole 'lotta fun. "Dead-End Drive In" is a super fun ozploitation in a similar vein as "Escape from New York" and "Mad Max". The folks Down Under really know how to shoot car action scenes like no other. Is that just the weirdest premise for a film ever? How did that thing get funding? The Wheels and tires drive me a little crazy. A quick fix though. I'm a little troubled that the engine is covered in sanding dust, and that at the same time the carburettor is not wearing an air cleaner. That's just a failure of basic engine hygiene. I have never seen any FnF movie, and don't intend to start now. If that clip is representative of the condition the car was in when they finished filming, just start over with a new shell. I wasn't going to jump in on this one because you guys aren't really into movies and I have other friends who are that love to discuss them. But for those of you wondering why the franchise even exists, I give you the numbers...as in the millions and millions that the current film raked in over the opening weekend. Huge. You know that saying that goes, "Because Miata"? Yeah, this movie is "Because $$$". Plus they got the bonus of Paul Walker's poor corpse. There will be more and then there will be the spinoffs. It's a sure bet, campers. And they'll all be dumber than the last. It's too bad because there are some spectacular car-focused out there that don't get any attention.